This product is designed to control the growth of unwanted vegetation in an environmentally safe manner. This is accomplished without adding to your runoff problems, as would be the case when using asphalt, concrete, or other nonporous weed-control methods. This type of roll is standard for use on new construction or where guardrail is not attached to the guardrail post or the cable is not attached to the barrier. The roll is punched with a hole larger than the actual size of your guardrail post or cable barrier. The standard spacing for the guardrail punch-out is 6’3″ center of hole to center of hole. Some guardrails require spacing of 12’6″and the cable barrier (aka: guard cable or cable rail) can have spacing of 10′, 12’6″, 16′ or 20′. We can accommodate any consistent spacing. The punch-out is also centered in the width unless otherwise specified. WeedEnder® Punched Rolls have punch-outs and are available in different lengths and widths. The standard length is usually 250′ long. This may vary because of the mill-run when the material is originally made. Each roll will be clearly marked with the footage on each roll. (Your order will total the correct length.) You may also order odd-size lengths to fit specific needs. This is usually the case on every estimate. Widths may be any width from 1′ to 8′. The standard for single guardrail is 3′ to 4′. The standard for double guardrail is 4′ to 8′ and the cable barrier standard is 3′ wide. 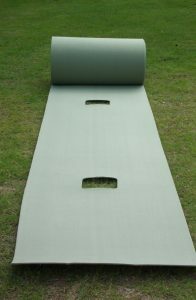 WeedEnder® rolls may be joined together for wider widths.